Though after Christmas, this is the fourth and final Advent series message. The Webster dictionary defines hope as looking forward with desire and reasonable confidence. New hope rises in us as we transition from hopelessness to being hopeful, and on to the highest level of hope called faith. We often grapple with enemies of hope on a daily basis. Listen to learn more. In the Bible, Moses says that all blessings come from God. We can never earn a place on the "nice" list and that is why God sent Jesus. Jesus came to exchange places for our sin and punishment. When we ask Jesus into our lives, God looks at us and sees His goodness. Because of Jesus, we are made alive and are changed from the inside out. We can learn to have joy no matter what is happening in our lives. Listen to learn more. Through Jesus, God makes His peace available for His people to live in. Peace is where we belong and peace is our home. Circumstances can cause us to lose our peace and kick us out of our home. We try to find peace in many different ways, but true peace can only be found in Jesus. Listen to learn more. 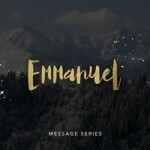 Our new series, Emmanuel, meaning God with us, starts the final countdown to Christmas. Jesus is front and center during this time of year. Jesus gave us a new commandment, to love one another as He loves us. As you listen to this message, you will glimpse what it means to live love as Jesus did.